I was recently interviewed a bit by Mens Health Magazine about wedding proposals so I thought I would share the article. Relax. We've asked the experts how to prepare for a proposal that'll leave her speechless -- almost, anyway. She's got to get at least one word out. In our poll, women were all over the board with their ideal spot -- a restaurant, a landmark, at home, on vacation. But it's most important that you pick a place with meaning, a place that has a story behind it. Is she a traditionalist? Take her back to the first place you met or went on a date, and then talk about what the future may hold. Start a dialogue that leads up to that one burning question -- and make sure you ask it. 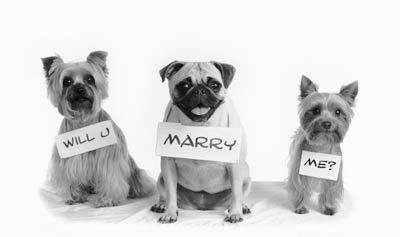 Sixty-three percent of men and 67 percent of women think the specific query, "Will you marry me?" is essential. Make sure you bring the ring -- 38 percent of women said proposing without a ring is the biggest mistake a guy can make -- but be double-sure you bring the emotion and personal significance.